It all started on Friday, July 4th, with a morning workout. 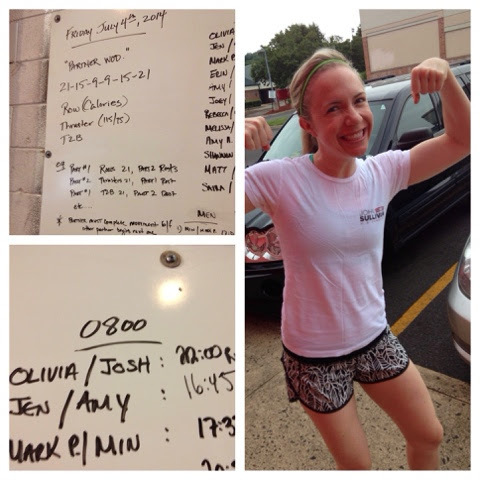 We had a partner WOD, and Josh and I chipped away at all of the reps together. He is my favorite partner at CF and in life (Que the cheese). Josh's sister and nephew were in town for a visit. So after a shower and some breakfast, we all jumped in the Jeep and made our way to Mount Vernon for the day. I have been to Mount Vernon a few times, but this trip was definitely the best. Just prior to our arrival, a naturalization ceremony had just been performed and all of the new American Citizens were walking around the grounds with their certificates and flags. You could see the pride emanating from their faces and it made me tear up several times. I already feel so thankful and proud to live in our wonderful country, but seeing the new citizens with so much emotion and gratitude made it even more powerful. God Bless the USA and all of the men and women who sacrifice daily to protect our freedoms. Mount Vernon also had reenactments, fireworks, cannon shooting and lots of live music. I highly suggest it for future Independence Day celebrations. 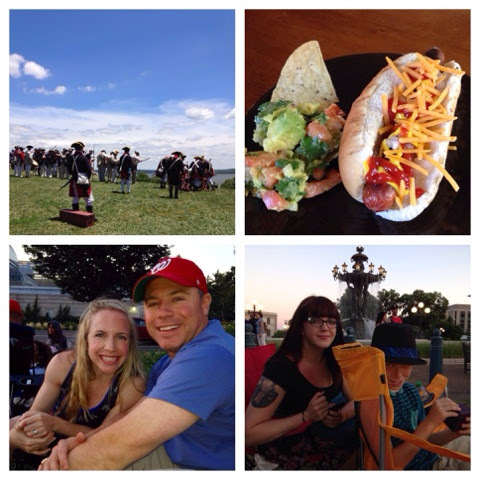 After Mount Vernon, we grilled some hot dogs, had a quick nap and then ventured to the Mall for the Firework display. 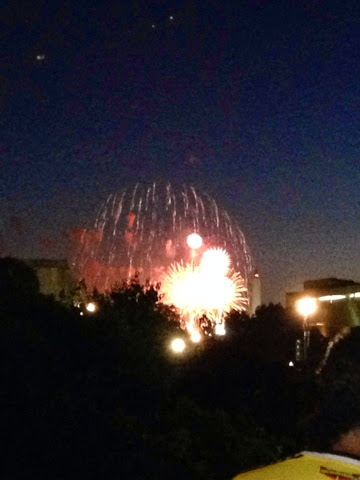 DC knows how to put on a good show! The next morning, we woke up before the sun was up to board a bus bound for NYC. 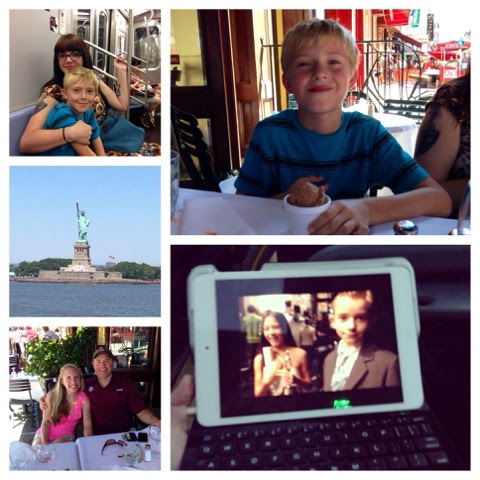 NYC was the main reason for Dax and Taylor's trip and we were all excited to get started. 4 Hours later (and what might have been the scariest bus ride ever), we safely arrived in the Big Apple. NYC is hands down my favorite US city and I loved being a part of Dax & Taylor's first trip. We hit the ground running and didn't stop until late that night. 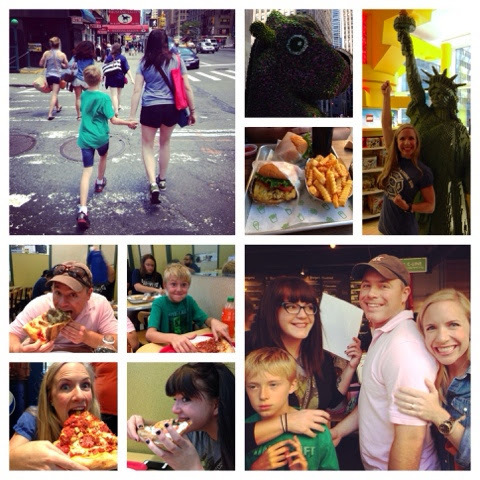 We checked off most of the major attractions on day one: NYC Pizza, Central Park, Strawberry Fields, The Strand, FAO Schwartz, The Plaza, Time Square, 5th Avenue, St. Patrick's Cathedral, Rockefeller Center and Shake Shack! 2. It runs all day everyday. 3. it gives you a great view of the Lady Liberty. If we had chosen to wait in line for the real tour, we would have been there all day. After our boat ride, we stopped by the Financial District and the 9-11 Memorial.The last few times I have been in NYC the memorial was still under construction. I can remember exactly where I was when the towers were hit and seeing the memorial brings it all back to present day. 13 years later we continue to fight the war on terrorism, and seeing the memorial was another reminder of how thankful I am for the men and women in our armed forces. Later after a late lunch in Little Italy, it was time for me to gather my things and get back on the bus. Everyone else was staying for one more day but I had to get back for work on Monday. This bus ride was much less scary but took way longer because of all of the traffic. Luckily, I had my iPad to keep me entertained and watched a great documentary about aspiring ballerinas called First Position. I highly suggest it! And there you have it, a jam-packed but super fun weekend. How was your July 4th weekend?